Lion portrays just how intense and obsessive the human desire to be found can be. It is based on the true story of Saroo Brierley and his memoir A Long Way Home, and how he was able to find his way home after being lost for so many years. When Brierley is five years old, he gets separated from his family and his village in Northwest India. He mistakenly wakes up on the wrong train and travels to the distant, foreign city of Calcutta (now known as Kolkata). There he lives on the streets before he is sent to an orphanage and is adopted by Tasmanian couple John and Sue Brierley (played by David Wenham and Nicole Kidman). Sunny Pawar plays the young Saroo.The one word that describes Pawar is adorable. His secret weapon is his eyes; they are big and brown and could melt even the coldest heart, a natural talent that is a rare gem nowadays. Dev Patel plays the older Saroo. Patel gives a fantastic and realistic performance of a young man going from a state of ignorance to a complete and intense longingness to find home. Patel has a gift that allows him to transform into any role he’s given. As Saroo, he breaks his nerdy archetype that he has been given from his previous work (Slumdog Millionaire, The Newsroom, The Best Exotic Marigold Hotel). The cinematography plays an important role in Lion. When the action centers around young Saroo, the camera shows what he is seeing. With this technique, the viewer empathizes with him in that moment. The film is also shot on location in India and Tasmania, adding the setting to the long list of pleasing features in this film. Another aspect is sound. Throughout the film, Saroo is haunted by the sound of himself as a little boy calling out to his lost brother. Every time he thinks back he can always hear himself, lost and afraid. Language and communication play a large part as well. Three languages are spoken throughout the film. Saroo is from a part of India where Hindi is the predominant language, where other areas, like Calcutta in the East, speak Bengali. When he arrives in Calcutta, he faces a drastic language barrier since he cannot understand what is being said around him, and others can’t understand him. When Saroo is finding home, he uses mass communication through the internet and Google Maps. Lion has been nominated for six Academy Awards, including Best Picture, Best Adapted Screenplay and Best Supporting Actor Actress for Patel and Kidman. 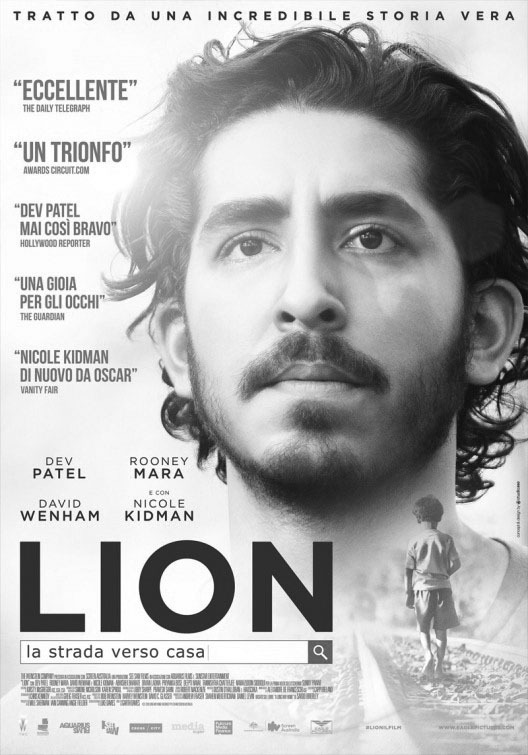 The success of Lion doesn’t lie in glitz or glamor, but in the true, gritty story of determination and hope.